This movie is a sci-fi "Invasion of the Body Snatchers" kinda movie with aliens invading Earth and using human bodies as hosts to wipe out the rest of the humans. The plot is nothing new and this movie certainly doesn't use it well. The first 3 waves are: EMP to kill all electricity, tsunamis to wipe out most of the humans, virus to finish off more humans. Then it gets more ridiculous. 4th wave is to capture all children and kill all adults. 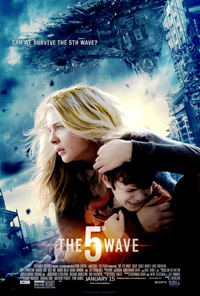 Then the 5th wave is to train the children to wipe out the few remaining living humans. The survival track, with Chloë Moretz as 16-year old Cassie, works okay. The track with the children being trained as soldiers is almost unwatchable. Lousy acting by annoying kids, embarrasingly bad dialogue and so totally unbelievable and pointless that you'll end up checking your watch every 10 minutes, just to see when the hell you can leave this trainwreck of a movie. Oh there's a love story too. Chloë and 2 guys. It's bad. It's horrible teenage drama and it physically hurts to watch it. This movie should be banned in every country on planet Earth and somebody has to stop any sequels before they ever get made. It is based upon a novel by Rick Yancey and how impossible it may sound it is planned to be a trilogy!? I usually don't support the burning of books, but in this case it could be the only way to save humankind from this unspeakable evil. I'm not sure who is the target for this garbage, but I suppose it could be retarded 11 year olds. If they weren't retarded to begin with they'll certainly be after watching this.